InnovMetric Software Inc. announced that it has developed a free plug-in for the Nikon Metrology Laser Radar MV224 and MV330/350 devices. Operated with PolyWorks|Inspector™, this plug-in is fully integrated into version 12.1 of PolyWorks. 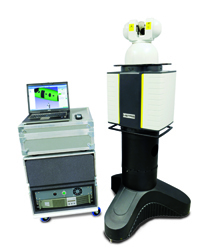 The Nikon Laser Radar is a solution of choice for large-volume inspection as it provides automated, non-contact, and targetless 3D measurement. With this new plug-in, the capabilities of the Laser Radar device can now be extended to PolyWorks. What’s more, since the development of the plug-in is based on Nikon’s software development kit (SDK), it offers the specialized measurement techniques that Nikon has developed over the years. The seamless integration of this plug-in enables operators to drive the Laser Radar with PolyWorks|Inspector. InnovMetric also developed innovative measurement techniques based on the nominal definition where the operator simply selects the features with nominal components and comparison points, and with a single click, all measurements are automatically performed. Read more about this release on www.Innovmetric.com.